The Nokia MVNO rumour first surfaced in 2008... remember this was way before Microsoft, iPhone had only just launched a phone with a proper radio in it (iPhone 3G) and Android was on version Cupcake (1.5) and Donut (1.6) with the main device being one from HTC that had spoilers on it! 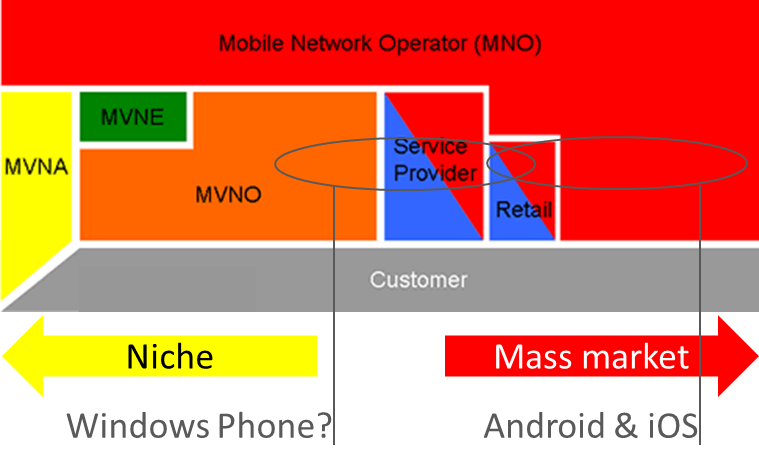 Could the service retail and even MVNO model be the WP8 market sweetspot? ...as commented here in MVNOs from a customer perspective there is a definite shift to where mass market that want an unlimited bundle and untamed device go to the main network operator. MVNOs compete more effectively on their own terms, creating niches... which, forgive me if I am wrong, but appears to be where maybe WP8 can be very strong, especially an LTE 4G MVNO? Reportedly Nokia is planning a Hardware MVNO in Japan, which would push the OVI portal services within this market. As correctly pointed out in this article, by Rethink wireless that Nokia has found it difficult to enter the Japanese market due to the operators' insistence on using i-mode type services, these services will not necessarily be a barrier to the success of a hardware andon device portal MVNO. Firstly, if we look at the rise and fall of AOL as a portal to the fixed line, it rose and fell with dial-up. AOL provided a cost efficient an effective way to get on-line in the pre-broadband stage, when what is effectively a walled garden worked well. As the beginnings of what we now call web 2.0 came along as well as broadband, we had to climb out of our analogue shell and into the digital world, helped along by the magic of google. part of the pain of adoption that had to be overcome was moving over to the monthly line rental and learning what ADSL means and what an upstream and a downstream where...The mobile world has now catapulted itself into this mass market phase, from 2006 when we had 176 x 208 screens with tens of thousands of colours, operators would share with me how they struggled to get over 7 days per month WAP or mobile internet usage out of even ABC1 clients. In this space, i-mode wins, and the uptake of i-mode over WAP in Europe shows that, as does the uptake of AOL fuelled internet over that of the typically dial-up model in non AOL territories. In 2009, we have GPS enabled QVGA+ 3"+ screens with millions of colours and HSDPA and wi-fi, and the world is a very different place. OVI lets you upload your photos to flicker and VOX, video call, IM chat and everything you once dreamt of doing on a laptop but practicality never allowed, can now be done, and that is something that will be driven by an "open" Nokia approach, rather than the unspeakably annoying operator approach, whereby by Orange branded Nokia interrupts my second photo while I have to cancel it asking me if I wish to upload the first to my Orange album, even though I have refused every attempt it has tried for me to set-up and Orange album... (after having carried out what seems like decades of user testing for Nokia, I can only imagine Nokia's horror when operators ask for features like this) and why would i want to share my items with just other orange users, presumably in the UK, when my network has outgrown this model and Vox and Flickr let me share with the world, even after I have left Orange. Secondly, device connectivity has moved beyond the control of the mobile operator, and with it the user has outgrown the heavily modified handset. People now want an iPhone, or an N96 or a C905, and they do not want it to have been messed around with too much, like the "upload this photo to Orange" intrusion, I also want to update my software when Nokia have made it available, not when the operator has had time to play with it and tweak it: While operators like Vodafone in the UK are very good at releasing updates for their variants, my N82 on orange is still stuck on its original build 10.x where the internet radio still does not work and a handful of other bugs are present, all of them removed on the build 12.x that everyone else is on. Then there is the connectivity, like with the online scenario: When we only had dial-up, we did not mind AOL commandeering our modem and stopping any other pesky diallers eating our money. 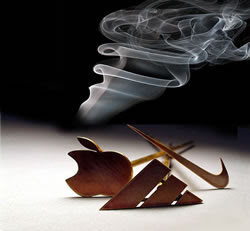 however, in these days of multiconnectivity, we do not want AOL messing with our vodafone 3G connection or wi-fi hotspot connection. In the same way, we are tired of having an operator driven phone full of bookmarks that respond with "this service is only available via GPRS..." every time we are on wi-fi.